I know it has been a while since I have posted, but I have been surprisingly busy. I will finish letting you all know about my time in the Czech Republic...finally. In Czech they pronounce Prague, Praha, which I really liked so no, that is not a typing error above. I know two days does not sound like much, but I like to think that in those two days I was able to see a lot of Prague, if not, almost the whole city. Thankfully, Nicolina is the perfect tour guide and she had each day planned out for us as well as the city mapped out in order to make our way around by foot (I mean...we also had a map handy). I just wanted to let you all know that we walked so much that the day I was back in Madrid, I was in bed all day recovering. I swear I am usually a pretty active person (aka: working out like once a month), but I was wiped out and it was completely worth it. 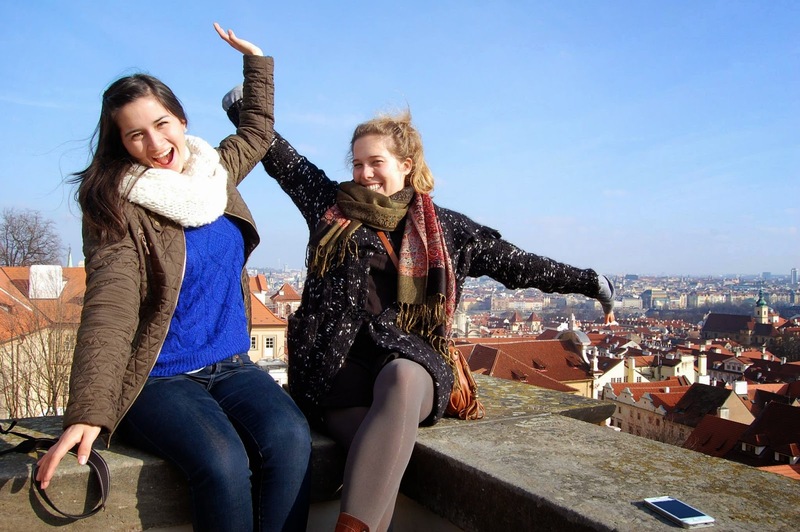 On the first day in Prague, we spent most of our day in Malá Strana and Old Town. We walked through Petřín Hill and made our way to the Petřín Lookout Tower. Apparently, the artist was inspired by the Eiffel Tower in Paris and it was definitely a close second. So I basically was in Paris and Prague at the same time, lucky me :) We saw a great view of Prague at the top, which was completely worth all the stairs we climbed. 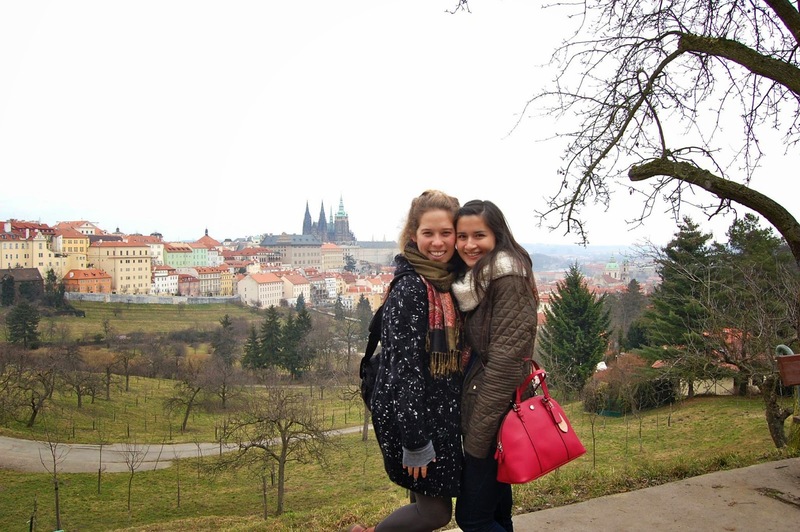 Afterwards, we walked along a trail to reach the Prague Castle. Along the way to the castle, we stumbled across this adorable outside market. 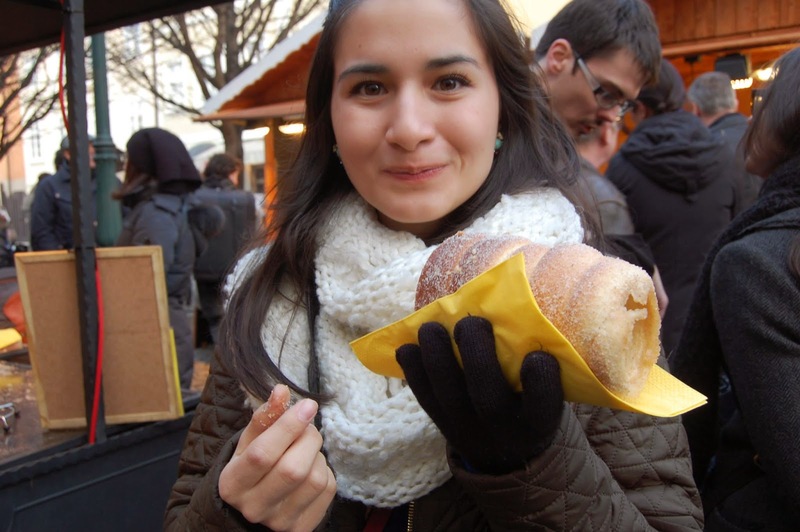 I wanted to get my full Czech experience, which includes the food. I bought a black sausage...I still do not know why out of my selection I chose the darkest one, I initially regretted it, but it turned out to be quite delicious. I still do not know what it contained and I am okay with that. Before going inside the Prague Castle, Nicolina and I found a great spot to take some pictures of the city...here comes our little photo shoot. Okay, so a little story I will have to share with you. Although we look so casual and happy in the pictures, there was a little incident beforehand. So we sat on top of a lookout, which means we had to hop up there. Nicolina was already sitting up on the corner so I tried going up on my own, like a big girl. She did not move over enough for me to get enough momentum to hop up so I was stuck trying to lift my whole body weight. Picture me literally just dangling my legs and trying as hard as I can to lift my body up. Nicolina just laughed with some encouraging words, "Come on, you can do it." No, no I can't. I don't think anyone realizes how weak I actually am, especially lifting my body. I could feel my face getting really warm and red because it was not so much the fact I was failing to lift myself up, but people were watching me. The man who we asked to take the picture of us was just staring at me, as were his friends. Then after an embarrassing moment of struggle and realizing that, okay, she really can't get up on her own, the man came over to me and lifted me up. I laughed nervously and snorted. I realized that even as a 20 year old, I will need a little lift sometimes. We went inside the St. Vitus Cathedral, which the Prague Castle surrounds and it was magnificent. The Cathedral had some of the most beautiful stained glass windows I have ever seen. Nicolina shared with me that the Church did not have enough money to finish some of the stained glass windows during the construction, so they had to contact the bank for some help. The bank agreed if only the Church put their name on one of the stained glass, a sort of advertisement. They agreed and it is the first time an advertisement ever appeared in a Cathedral. 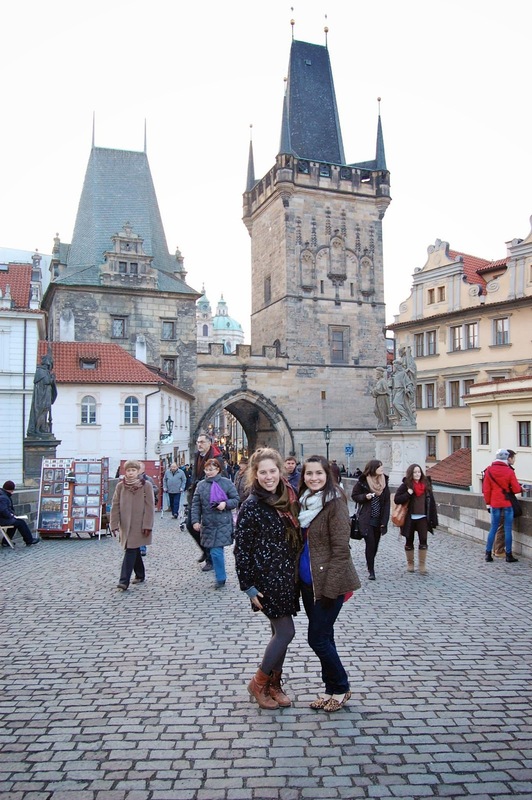 We continued along the path toward the famous Charles Bridge. We stumbled across a little spot with swans. Swans are one of my favorite birds, although they can be a little aggressive, they are so elegant. I am always amazed at their beauty. Anyways, I did not realize that Franz Kafka was from Prague, Czech Republic and was initially confused by the museums, stores, and statues made in his honor. Then it clicked. I think one of my favorite moments involved a little girl and a unique fountain. I was standing outside the Franz Kafka Museum and Nicolina told me there was something a little different about the fountain, and I think a little girl realized it too... Afterwards, Nicolina and I bought these delicious cinnamon twists, only they were way better than any cinnamon twist you could buy back home. You could watch them as they baked the bread over a coal fire, very delicious. 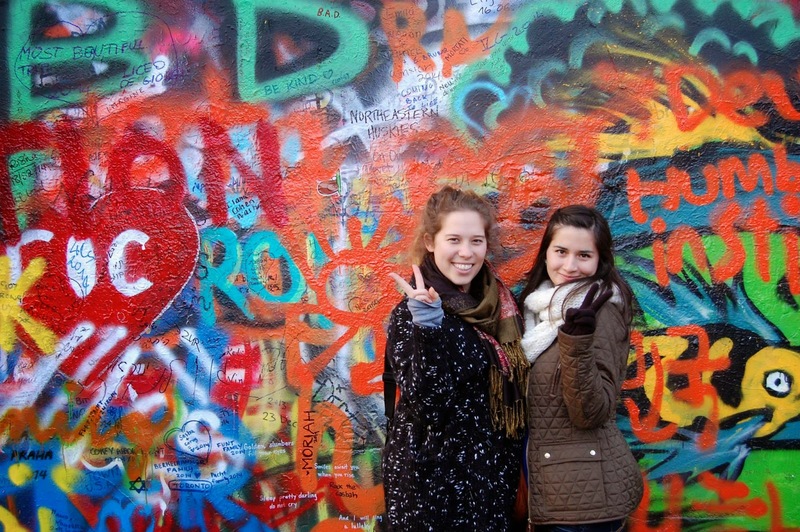 We stumbled across the Lennon Wall and then made our way to the Charles Bridge. After crossing the bridge, we were in Old Town. The sun was beginning to set and I got an evening look at the Astronomical Clock and we made it just in time for the hour. Every hour, the clock rings and little figurines at the top move their bells. We had been walking around all day and decided to call it a night. First day in Prague was a success.